Kamal Tambe is one of the most respected names of the Jaipur-Atrauli gharana. She was a performer and teacher par excellence, but unfortunately passed away early after a prolonged illness. Kamaltai received her taleem from the legendary Mogubai Kurdikar and remained as one of her senior most disciples. Her music was rooted in Mogubai’s idiom, to which she added her personal interpretations. Her gayaki was said to be very disciplined and imbued with vigour, with particular emphasis on raga form and strictness in its execution. Her recitals included presentations of the khaas ragas of the Jaipur-Atrauli gharana and received raving reviews. She also accompanied her guru in several concerts and received appreciation for the same. 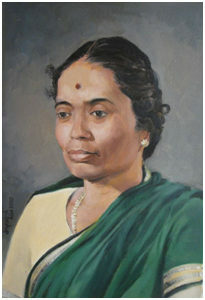 Kamaltai was also a composer – her Tarana in the raga Savani Nat is a popular drut cheez sung in that raga. Kamaltai was a passionate teacher who trained many disciples, like Pratima Tilak, Sukhada Kane, Shaunak Abhisheki, and many others. Her life was wholly dedicated to music and the gharana, and after her death a memorial fund was setup in her name which awards scholarships to deserving students who are dedicated towards music.